Shoes are in very good pre-owned condition. Very little wear. Good used condition ~Leather uppers have some wear on toes(please see all pics) •Contact me with any questions. •I ship USPS priority mail same day guaranteed!! •Thanks for viewing my listing!! 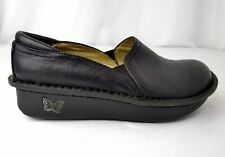 Alegria Shoes Maryjanes Women Size 37 US 6 Black Leather Upper. Beautiful shoes marks of use and wear very strong shoes lots of life left Condition is Pre-owned. Shipped with USPS Priority Mail. 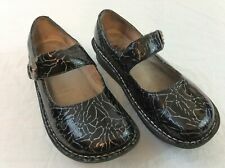 Alegria Shoes Maryjanes Women Size 37 US 6 Black Leather Upper. Condition is Pre-owned. Shipped with USPS Priority Mail. Alegria Womens 36 US Size 6 Crackle Black Mary Janes Shoes EUC. Excellent used condition. Alegria KEL-752. Black Leather Woven Look. Shoes worn once, mint condition. Alegria Paloma Flat Black Embossed Leather Rose Comfort Maryjane Shoes Style PAL-531 Women's Size 36 US 6-6.5 Excellent condition - Heel cushion Inserts on back - shown in pictures, Minimal wear. Please see pictures for more details as they are an exact representation as to what you will receive. Structured, flat, and stable outsoles that promote perfect posture and reduce stress on muscles and joints. Payment is due within 4 days of item end. If at all unsatisfied please let me know. Size 37EU 6 1/2US in black. Alegria wedge clog slipon loafer. Auctiva's FREE Counter. Shoe is showing creasing at the vamp ans scuffing on the toe. Alegria TUS 532 Womens Size 36 W Black Metallic Silver Shoes Wide Width NWOB US size 6 / 6.5 Please know your size in these shoes. New, No Box. Fast Priority shipping! Iconic Alegria comfort is the highlight of this shoe. Features like a fully enclosed back to protect your heels, a heel bumper for even more comfort, and the patented removable insoles will make you want to wear these shoes even after your shift is over.